It's called the "Garden Isle", and that's your clue about what to expect: verdant natural beauty, and a slower pace. If you want shopping, night-life, and high-rises in Hawaii, that's spelled "Waikiki". 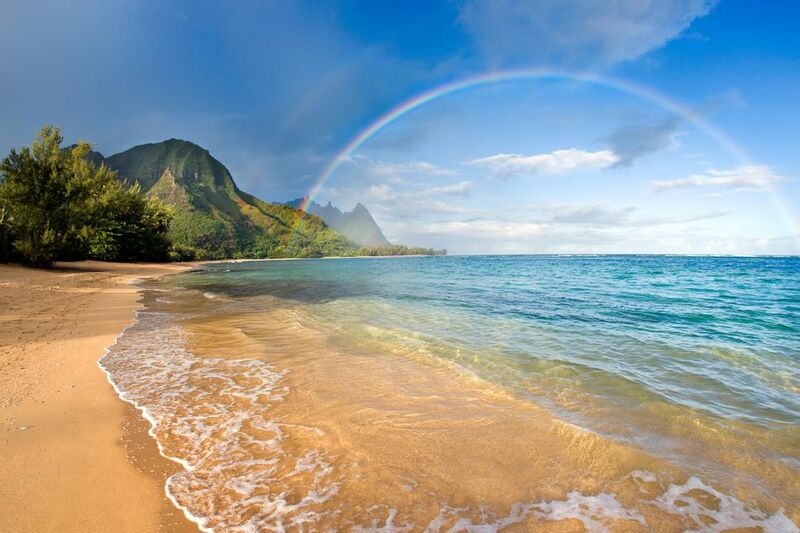 Kaua'i is a small island, 33 miles long and 25 across. Many of the beautiful beaches are great for surfers but not swim-able, particularly for kids; some resorts compensate with creative pools. It's tough to choose which way is best, to see the stunning Napali Coast: by helicopter or by boat. But perhaps the optimal way is both; first, from the sea, and later from the air. The Napali Coast State Park is in the northwest of Kauai and -- simply put-- has some of the most breathtaking scenery on earth: fold after fold of thousand-foot-high cliffs, by the sea. A highlight on our Napali boat trip was the sight of Hawaii's beautiful spinner dolphins: who literally spin when they jump out of the water. These playful animals are a delight, for kids and adults both. Several raced alongside our catamaran, at a terrific speed. This gets my vote as the best way to see dolphins: in the wild, and freely enjoying themselves. We also saw sea turtles, on our boat trip in August, and had a snorkeling stop. If you want to see even bigger marine life, visit in winter, and take a whale-watching boat trip on the south coast. On Kauai, an aerial tour is highly recommended. Many scenic areas are inaccessible, or hard to reach, by car; the birds-eye view of Kaua'i's cliffs and canyons is spectacular, and the size of the island makes a good fit with an hour-long tour by air. Helicopters are great for swooping into canyons; small planes do island tours as well and reportedly can get into canyons too. Even toddlers can fly! The back-story for this adventure is part of Kaua'i's history: the setting is an old sugar plantation. Sugar was a thriving industry in Kaua'i starting back in the 1800's; people from many countries came to the island to work as laborers. But the sugar industry dwindled decades ago; by the 21st century this plantation, like others, was inactive, its long irrigation ditches useless until someone had the bright idea of floating in tubes down the ditches. The fun parts of this adventure are in the hand-dug tunnels: kids will love wearing helmets equipped with miners' lights. Highly recommended! Lots of fun, and extra points for novelty. Zip-lines are becoming de rigeur on islands from Costa Rica to Kauai, it seems. Even kids as young as seven can fly through the air with the greatest of ease. Another nice aspect of our zip line/canoeing adventure was the chance to enjoy a couple of rope-swings (one of which had been famously swung on, in an Indiana Jones flick) and swimming holes. Hawaii has its share of glitz, shopping, and luxury resorts; but it also has an endearing unpretentious side, with shops selling shaved-ice or home-made pies, or local souvenir shops in old-fashioned style from the sugar town days. You'll need a car to explore towns like Hanalei, on the northeast coast. Also in the northeast, and (literally) near the end of the road: Limahuli Garden and Preserve. An extraordinarily beautiful place; take a self-guided tour. Movie Tours are offered by several companies. "Jurassic Park" is the biggest name, from the kid point of view; but lots of other movies have been shot here, too. ATV Tours - kids must be at least 16 to drive; typically, ages 5 to 15 can ride as passengers. Luau: a rite of passage for tourists, with big down-home-food-style of a buffet (always including a pig roasted in the earth), and a night show with costumed dancers. Smith Family Garden Luau is a popular choice; arrive early and tour the gardens.